This Regulation applies to adaptive front-lighting systems (AFS) for motor vehicles of categories M and N (1). Lamps produced by the same manufacturer differing only by the trade name or mark shall be considered as being of the same type. The characteristic(s) of the signal(s), specified for the system. References made in this Regulation to standard (étalon) filament lamp(s) and gas-discharge light source(s) shall refer to Regulations Nos 37 and 99 respectively, and to their series of amendments in force at the time of application for type approval. 2.1. The application for approval shall be submitted by the owner of the trade name or mark or by his duly accredited representative. In the case of adaptation of the driving-beam, which lighting units (4) provide or contribute to the gradual adaptation of the driving-beam and of the sensor system along with the technical characteristics relevant to their operation. Gives access to the relevant documents demonstrating the system's performance concerning sufficient reliability and safe operation of the measures specified according to the subparagraph 2.2.2.1(a) above, e.g. FMEA (‘Failure Mode and Effect Analysis’), FTA (‘Fault Tree Analysis’) or any similar process appropriate to system safety considerations. Two samples bearing the new trade name or mark or equivalent documentation. In case of a system according to paragraph 4.1.7 below, a vehicle representative of the vehicle(s) indicated according to paragraph 4.1.6 below. 3.1. The installation units of a system submitted for approval shall bear the trade name or mark of the applicant. 3.2. They shall comprise each, on the lenses and on the main bodies spaces of sufficient size for the approval mark and the additional symbols referred to in paragraph 4; these spaces shall be indicated on the drawings referred to in paragraph 2.2.1 above. 3.2.1. If however the lens cannot be detached from the main body of the installation unit, one marking as per paragraph 4.2.5 shall be sufficient. 3.3. The installation units or systems designed to satisfy the requirements both of right-hand and of left-hand traffic shall bear markings indicating the two settings of the optical element(s) on the vehicle or of the light source(s) on the reflector(s); these markings shall consist of the letters ‘R/D’ for the position for right-hand traffic and the letters ‘L/G’ for the position for left-hand traffic. 3.4. In the case of an AFS with LED module(s), the corresponding installation unit(s) shall bear the marking of the rated voltage and rated wattage and the light source module specific identification code. Shall bear the specific identification code of the module. This marking shall be clearly legible and indelible. 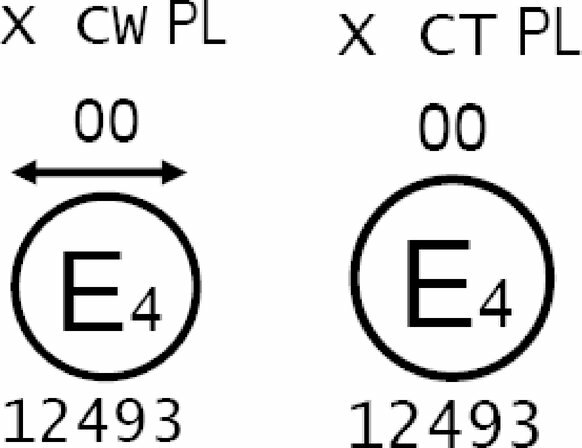 This specific identification code shall comprise the starting letters ‘MD’ for ‘MODULE’ followed by the approval marking without the circle as prescribed in paragraph 4.2.1 below and in the case several non-identical light source modules are used, followed by additional symbols or characters. This specific identification code shall be shown in the drawings mentioned in paragraph 2.2.1 above. The approval marking does not have to be the same as the one on the lamp in which the module is used, but both markings shall be from the same applicant. If the LED module(s) are non-replaceable, the markings for LED module(s) are not required. 3.6. If an electronic light source control gear which is not part of a LED module is used to operate a LED module(s), it shall be marked with its specific identification code(s), the rated input voltage and wattage. 4.1.1. If all the samples of a type of a system submitted pursuant to paragraph 2 above satisfy the provisions of this Regulation, approval shall be granted. 4.1.2. Where lamps being grouped, combined or reciprocally incorporated with the system satisfy the requirements of more than one Regulation, a single international approval mark may be affixed provided that each of the grouped, combined or reciprocally incorporated lamps satisfies the provisions applicable to it. 4.1.3. An approval number shall be assigned to each type approved. Its first two digits shall indicate the series of amendments incorporating the most recent major technical amendments made to the Regulation at the time of issue of the approval. The same Contracting Party may not assign the same number to another type of system covered by this Regulation. 4.1.4. Notice of approval or of extension or refusal or withdrawal of approval or production definitively discontinued of a type of system pursuant to this Regulation shall be communicated to the Parties to the 1958 Agreement applying this Regulation, by means of a form conforming to the model in Annex 1 to this Regulation, with the indications according to paragraph 2.1.3. 4.1.4.1. If the installation unit(s) is/are equipped with an adjustable reflector and if this/these installation unit(s) is/are to be used only in mounting positions according to the indications in paragraph 2.1.3 the applicant shall be obliged by approval to inform the user in a proper way about the correct mounting position(s). 4.1.5. In addition to the mark prescribed in paragraph 3.1, an approval mark as described in paragraphs 4.2 and 4.3 below shall be affixed in the spaces referred to in paragraph 3.2 above to every installation unit of a system conforming to a type approved under this Regulation. 4.1.6. The applicant shall indicate in a form corresponding to the respective model in the Annex 1 to this Regulation, the vehicle(s) for which the system is intended. 4.1.7.2. The system shall be approved according to Regulation No 10. In every case the relevant operating mode used during the test procedure according to paragraph 1.1.1.1 of Annex 4 and the permitted voltage(s) according to paragraph 1.1.1.2 of Annex 4 shall be stipulated on the approval forms and on the communication forms transmitted to the countries which are Contracting Parties to the Agreement and which apply this Regulation. On an installation unit meeting the requirements of this Regulation which is so designed that the light source(s) of the passing-beam shall not be lit simultaneously with that of any other lighting function with which it may be reciprocally incorporated: an oblique stroke (/) shall be placed after the passing-beam symbol(s) in the approval mark. 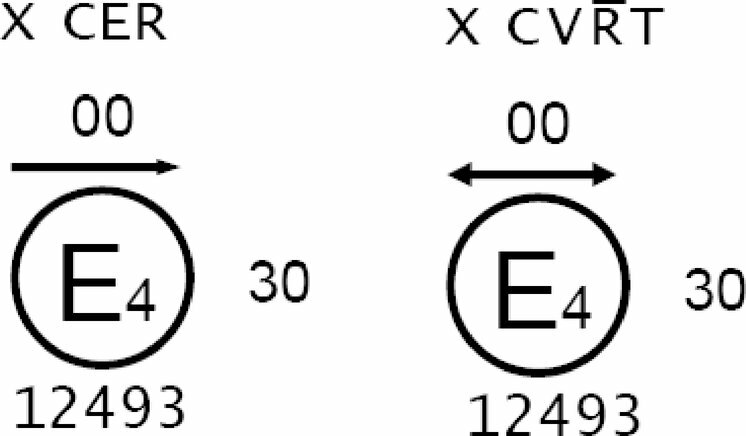 On an installation unit meeting the requirements of Annex 4 to this Regulation only when supplied with a voltage of 6 V or 12 V, a symbol consisting of the number 24 crossed out by an oblique cross (X), shall be placed near the holders of the light source(s). The two digits of the approval number which indicate the series of amendments incorporating the most recent major technical amendments made to the Regulation at the time of issue of the approval and, if necessary, the required arrow may be marked close to the above additional symbols. The marks and symbols referred to in paragraphs 4.2.1 and 4.2.2 above shall be clearly legible and be indelible. They may be placed on an inner or outer part (transparent or not) of the installation unit which cannot be separated from its light-emitting surface(s). In any case it shall be visible when the installation unit(s) is/are fitted on the vehicle. The displacement of a movable part of the vehicle is permitted to fulfil this requirement. Annex 2, Figures 1 to 10, to this Regulation gives examples of arrangements of the approval mark with the above-mentioned additional symbols. 4.3.2.1.2. No part of the grouped, combined or reciprocally incorporated lamps that transmit light can be removed without at the same time removing the approval mark. Or in a group, in such a way that each of the grouped, combined or reciprocally incorporated lamps may be clearly identified (see for possible examples in Annex 2). 4.3.2.3. The size of the components of a single approval mark shall not be less than the minimum size required for the smallest of the individual marks by the Regulation under which approval has been granted. 4.3.2.4. An approval number shall be assigned to each type approved. The same Contracting Party may not assign the same number to another type of grouped, combined or reciprocally incorporated lamps covered by this Regulation. 4.3.2.5. 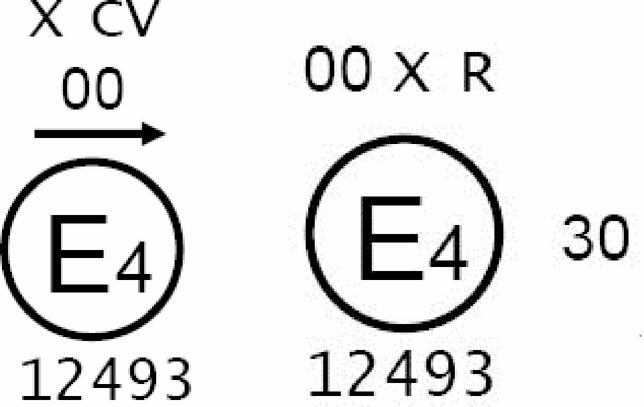 Annex 2, Figures 11 and 12, to this Regulation give examples of arrangements of approval marks for grouped, combined or reciprocally incorporated lamps with all the above mentioned additional symbols, and relating to a system with functions provided by more than one installation unit per side of the vehicle. 4.3.2.6. Annex 2, Figure 13, to this Regulation gives examples of approval marks relating to the complete system. Unless otherwise specified, photometric measurements shall be carried out according to the provisions set out in the Annex 9 to this Regulation. 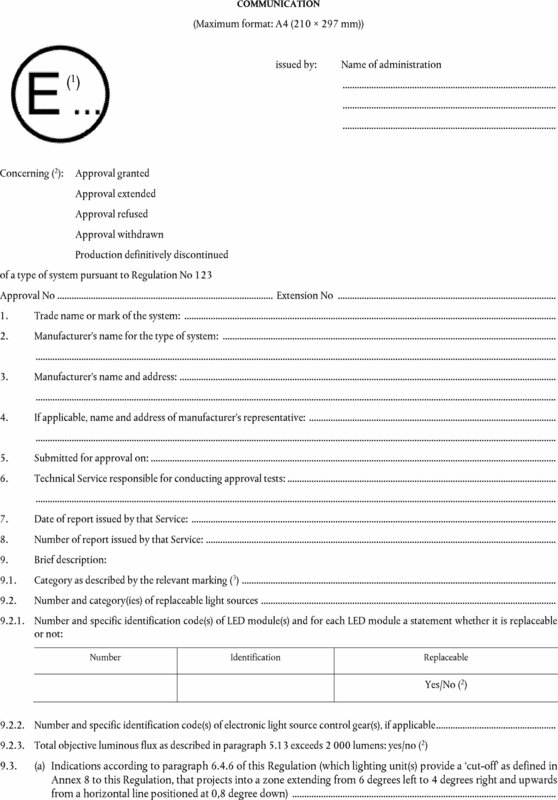 The requirements contained in sections 5 ‘General specifications’ and 6 ‘Individual specifications’ and in the Annexes referenced in the said sections of UN Regulation No 48, and their series of amendments in force at the time of application for the lamp type approval shall apply to this Regulation. The requirements pertinent to each lamp and to the category/ies of vehicle on which the lamp is intended to be installed shall be applied, where its verification at the moment of lamp type approval is feasible. 5.1. Each sample, when its approval is sought for right-hand traffic only, shall conform to the specifications set forth in paragraphs 6 and 7 below; if, however, its approval is sought for left-hand traffic, the provisions of paragraph 6 below, including the relevant annexes to this Regulation, apply with the inversion of right to left and vice versa. Correspondingly, the designation of the angular positions and elements is adjusted by exchanging ‘R’ for ‘L’ and vice versa. 5.1.2. Systems or part(s) thereof, shall be so made as to retain their prescribed photometric characteristics and to remain in good working order when in normal use, in spite of the vibrations to which they may be subjected. 5.2. Systems or part(s) thereof, shall be fitted with a device enabling them to be so adjusted on the vehicle as to comply with the rules applicable to them. 5.2.1. Such adjustment device(s) need not be fitted on systems or part(s) thereof, provided that their use is confined to vehicles on which the setting can be adjusted by other means or no such means are needed according to the applicant's system description. The lamp holder shall conform to the characteristics given on the data sheet of IEC Publication No 60061, as referred to in the relevant light source Regulation. The design of the device shall be such that the filament lamp can be fixed in no other position but the correct one. The Class C (basic) passing-beam shall be equipped only with replaceable light sources or replaceable or non-replaceable LED modules. In the case of replaceable LED module, the removal and replacement of this LED module, as described in Annex 11, paragraph 1.4.1, shall be demonstrated to the satisfaction of the Technical Service. 5.4. System(s) or part(s) thereof, designed to satisfy the requirements both of right-hand and of left-hand traffic may be adapted for traffic on a given side of the road either by an appropriate initial setting when fitted on the vehicle or by selective setting by the user. In any case, only two different and clearly distinct settings, one for right-hand and one for left-hand traffic, shall be possible, and the design shall preclude inadvertent shifting from one setting to the other or setting in an intermediate state. 5.5. Complementary tests shall be done according to the requirements of Annex 4 to this Regulation to ensure that in use there is no excessive change in photometric performance. 5.6. If the lens of a lighting unit is of plastic material, tests shall be done according to the requirements of Annex 6 to this Regulation. Forego the test if the headlamp presented by the applicant is accompanied by a test report, issued by a Technical Service responsible for approval tests for headlamps of the same construction (assembly), confirming compliance with this requirement. When performing the tests to verify compliance with these requirements, the Technical Service responsible for approval tests shall refer to the instructions supplied by the applicant. The user cannot, with ordinary tools, change the shape or position of the moving parts, or influence the switching device. 5.9. The system shall be so made that, if a light source and/or a LED module has failed, a failure signal in order to comply with the relevant provisions of Regulation No 48 shall be provided. 5.10. The component(s) to which a replaceable light source is assembled shall be so made that the light source fits easily and, even in darkness, can be fitted in no position but the correct one. 5.11. In the case of a system according to paragraph 4.1.7 above. 5.11.1. The system shall be accompanied by a copy of the form according to paragraph 4.1.4 above and instructions to enable its installation according to the provisions of Regulation No 48. The system, when installed in the vehicle, complies with the provisions of paragraph 6.22 of Regulation No 48. To confirm compliance with the provisions of paragraph 6.22.7.4 of Regulation No 48 a test drive is mandatory, which comprises any situation relevant to the system control on the basis of the applicant's description. It shall be notified whether all modes are activated, performing and de-activated according to the applicant's description; obvious malfunctioning, if any, to be contested (e.g. angular excess or flicker). 5.12. The AFS, if equipped with LED module(s), and the LED module(s) themselves shall comply with the relevant requirements specified in Annex 11 to this Regulation. The compliance with the requirements shall be tested. 5.13. In case of an AFS incorporating light sources and/or LED module(s) producing the basic passing-beam and having a total objective luminous flux of the lighting units as indicated under item 9.2.3 of the communication form conforming to the model in Annex 1 which exceeds 2 000 lumens per side a reference shall be made in item 9.2.3 of the communication form in Annex 1. The objective luminous flux of LED module(s) shall be measured as described in paragraph 5 of Annex 11. 5.14. In the case of the basic passing-beam in the neutral state being produced exclusively by LED modules, the total objective luminous flux of these LED modules shall be equal or greater than 1 000 lumen per side, when measured as described in paragraph 5 of Annex 11. So designed that regardless of the use of tool(s), it is not mechanically interchangeable with any replaceable approved light source. 6.1.1. Each system shall provide a Class C passing-beam according to paragraph 6.2.4 below and one or more passing-beam(s) of additional class(es); it may incorporate one or more additional modes within each class of passing-beam and the front-lighting functions according to paragraph 6.3 and/or 2.1.1.1 of this Regulation. 6.1.2. The system shall provide automatic modifications, such, that good road illumination is achieved and no discomfort is caused, neither to the driver nor to other road users. 6.1.3. The system shall be considered acceptable if it meets the relevant photometric requirements of paragraphs 6.2 and 6.3. If applicable, at any other signal(s) according to paragraph 1.10 of this Regulation and combinations of them, according to the applicant's specification. At least 37 500 cd shall be attained at point HV, for a system producing driving-beam only. At least 3 100 cd shall be attained at point 50 V when the Class C passing-beam is activated, for systems producing passing-beam only or alternately producing passing-beam and driving-beam functions as described in paragraph 5.7 of this Regulation. In either case the power supply shall be sufficient to secure the required rise of the high current pulse. The system shall, prior to the subsequent test procedures, be set to the neutral state, emitting the Class C passing-beam. 6.2.1.1. The system shall provide other means, e.g. optical features or temporary auxiliary beams, allowing for unambiguous and correct aiming. 6.2.1.2. Annex 8 does not apply to the traffic-change function as described in paragraph 5.8 through 5.8.2.1 above. 6.2.2. The system or part(s) thereof shall be aimed according to the requirements of Annex 8 so that the position of the cut–off complies with the requirements indicated in the Table 2 of Annex 3 to this Regulation. 6.2.3. When so aimed, the system or part(s) thereof, if its approval is sought solely for provision of the passing-beam, needs to comply with the requirements set out in the relevant paragraphs below; if it is intended to provide additional lighting or light signalling functions according to the scope of this Regulation, it shall comply in addition with the requirements set out in the relevant paragraphs below, if not being adjustable independently. 6.2.4. When emitting a specified mode of the passing beam, the system shall meet the requirements in the respective section (C, V, E, W) of part A of Table 1 (photometric values) and in Table 2 (Imax and ‘cut-off’ positions) of Annex 3 to this Regulation, as well as section 1 (‘cut-off’ requirements) of Annex 8 to this Regulation. When the T-signal corresponds to the vehicle's smallest turn radius to the left (or right), the sum of the luminous intensity values provided by all contributors of the right or the left side of the system shall be at least 2 500 cd at one or more points in the zone extending from H-H to 2 degrees below H-H and from 10 to 45 degrees left (or right). 6.2.5.4.1. However, this is not needed if, for positions relative to the system reference axis up to 5 degrees left, at 0,3 degree up from H-H, and greater than 5 degrees left, at 0,57 degree up, a value of 880 cd is in no case exceeded. 6.2.6. The system shall be checked on the basis of the relevant instructions of the manufacturer, indicated in the safety concept according to paragraph 2.2.2.1 above. 6.2.7. A system or part(s) thereof, designed to meet the requirements of both right-hand and left-hand traffic must, in each of the two setting positions according to 5.4 above meet the requirements specified for the corresponding direction of traffic. When signal inputs according to paragraph 6.1.4.3 of this Regulation apply, the requirements of the paragraph 6.2 above shall be fulfilled. The system shall, prior to the subsequent test procedures, be set to the neutral state. 6.3.1.1. Any lighting unit(s) which is/are not independently adjustable, or, for which the aiming was done with respect to any measurements under paragraphs 6.2., shall be tested in its/their unchanged position. 6.3.2.1.1. The maximum value (IM) shall in no circumstances exceed 215 000 cd. This value shall be rounded off to the value of: 5 – 10 – 12,5 – 17,5 – 20 – 25 – 27,5 – 30 – 37,5 – 40 – 45 – 50. 6.3.3.1. The system meets the requirements of the paragraphs 6.3.2.1.1 and 6.3.2.1.2 above with each lighting unit measured according to the relevant procedure indicated in Annex 9. The lighting unit(s) of the right side and of the left side each provide at least 16 200 cd at the point HV. 6.3.5. 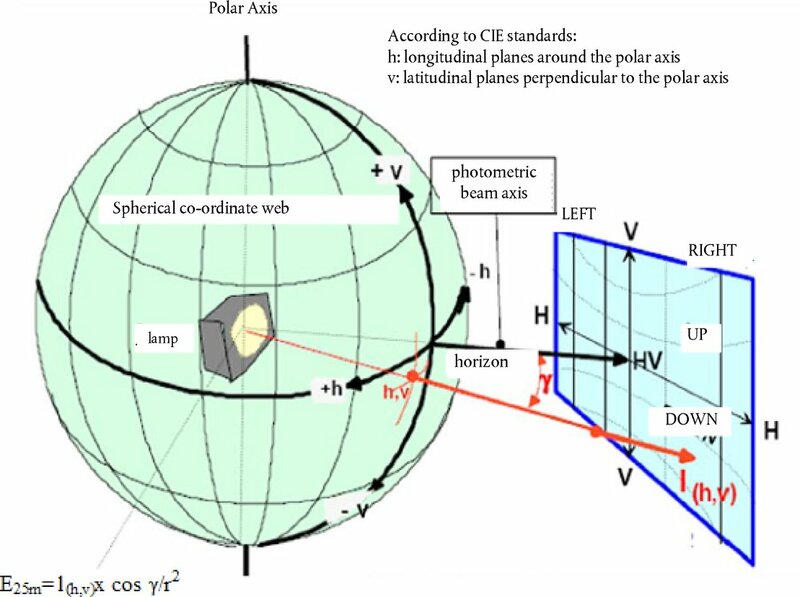 If the specified beam requirements are not met, a re-aiming of the beam position within 0,5 degree up or down and/or 1 degree to the right or left, with respect to its initial aiming is allowed; in the revised position all photometric requirements shall be met. These provisions do not apply to lighting units as indicated under paragraph 6.3.1.1 of this Regulation. 6.3.6. In the case of adaptation of the driving-beam function the system shall meet the requirements of the above paragraphs only when it is in the maximum condition of activation. 6.3.7. During adaptation, the driving-beam function shall meet the requirements for all the cases of right-hand and left-hand traffic specified in Part A of Table 7 in Annex 3 to this Regulation. These requirements shall be verified during the type approval testing in conjunction with a signal generator to be provided by the applicant. This signal generator shall reproduce the signals provided by the vehicle and cause the adaptation of the driving-beam and in particular shall represent the settings so that the photometric compliance can be verified. 6.3.7.1. If the driving-beam function meets the requirements in Part A of Table 7 in Annex 3 to this Regulation specified for line 1 to line 3 for oncoming and preceding vehicles (symmetrical beam) the relevant information shall be noticed in the communication document in Annex 1, item 18.5. 6.3.7.2. If the requirements of paragraph 6.3.7 above can be met for right-hand traffic or left-hand traffic only, the relevant information shall be reported in the communication document in Annex 1, item 18.5. 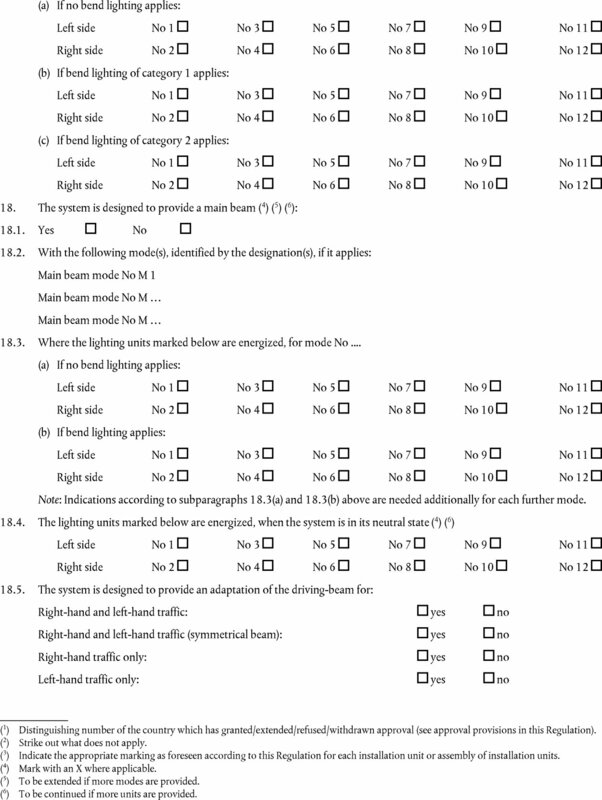 If the applicant has not asked for special mounting positions, the system or part(s) thereof shall be aimed for measurements of paragraphs 6.2 (passing-beam) and 6.3 above (driving-beam) with the relevant adjusting device(s) of the system or part(s) thereof in its mean position. The additional test of paragraph 6.4.3 above shall be made with the system or part(s) thereof, moved into its extreme positions (instead of ± 2 degrees) by means of the relevant adjusting device(s). It shall be stated by means of a form conforming to the model in Annex 1 to this Regulation, which lighting unit(s) provide a ‘cut-off’ as defined in Annex 8 to this Regulation, that projects into a zone extending from 6 degrees left to 4 degrees right and upwards from a horizontal line positioned at 0,8 degree down. It shall be stated by means of a form conforming to the model in Annex 1 to this Regulation, which Class E passing-beam mode(s), if any, comply with a ‘data set’ of Table 6 of Annex 3 to this Regulation. 7.1. The colour of the light emitted shall be white. 8.2. Confirmation or refusal of approval, specifying the alterations, shall be communicated by the procedure specified in paragraph 4.1.4 above to the Contracting Parties to the Agreement which apply this Regulation. 8.3. The Type Approval Authority issuing the extension of approval shall assign a series number to each communication form drawn up for such an extension and inform thereof the other Parties to the 1958 Agreement applying this Regulation by means of a communication form conforming to the model in Annex 1 to this Regulation. 9.1. A system approved under this Regulation shall be so manufactured as to conform to the type approved by meeting the requirements set forth in paragraphs 6 and 7 above. 9.2. The minimum requirements for conformity of production control procedures set forth in Annex 5 to this Regulation shall be complied with. 9.3. The minimum requirements for sampling by an inspector set forth in Annex 7 to this Regulation shall be complied with. 9.4. The Type Approval Authority which has granted type approval may at any time verify the conformity control methods applied in each production facility. The normal frequency of these verifications shall be once every two years. 9.5. Systems or part(s) thereof with apparent defects are disregarded. 9.6. The reference mark is disregarded. 10.1. The approval granted in respect of a type of system pursuant to this Regulation may be withdrawn if the requirements are not complied with or if a system or part(s) thereof bearing the approval mark does not conform to the type approved. 11.1. If the holder of the approval completely ceases to manufacture a type of system approved in accordance with this Regulation, he shall so inform the Type Approval Authority, which granted the approval. Upon receiving the relevant communication, that Authority shall inform thereof the other Contracting Parties to the 1958 greement applying this Regulation by means of a communication form conforming to the model in Annex 1 to this Regulation. 12.1. The Contracting Parties to the 1958 Agreement applying this Regulation shall communicate to the United Nations Secretariat the names and addresses of the Technical Services responsible for conducting approval tests and of the Type Approval Authorities which grant approval and to which forms certifying approval or extension or refusal or withdrawal of approval, or production definitively discontinued, issued in other countries, are to be sent. 13.1. From the date of entry into force of the 01 series of amendments to this Regulation, no Contracting Party applying it shall refuse to grant approvals under this Regulation as amended by the 01 series of amendments. 13.2. Until 60 months after the date of entry into force of the 01 series of amendments to this Regulation with regard to the changes introduced by the 01 series of amendments concerning the photometric testing procedures involving the use of the spherical coordinate system and the specification of luminous intensity values, and in order to allow the Technical Services to update their testing equipment, no Contracting Party applying this Regulation shall refuse to grant approvals under this Regulation as amended by the 01 series of amendments where existing testing equipment is used with suitable conversion of the values, to the satisfaction of the authority responsible for type approval. 13.3. As from 60 months after the date of entry into force of the 01 series of amendments, Contracting Parties applying this Regulation shall grant approvals only if the system meets the requirements of this Regulation as amended by the 01 series of amendments. 13.4. Existing approvals for systems already granted under this Regulation before the date of entry into force of the 01 series of amendments shall remain valid indefinitely. 13.5. Contracting Parties applying this Regulation shall not refuse to grant extensions of approvals to the preceding series to this Regulation. (2) For explanation only. The provisions of the passing-beam classes are dedicated to conditions as follows: C for the basic passing-beam, V for use in lit areas such as towns, E for use on roads such as motorways, W for use in adverse conditions such as wet road. (3) To be indicated in a form conforming to the model of Annex 1. (4) To be indicated in a form conforming to the model of Annex 10. (b) The adjustment of the ‘cut-off’ has been determined at 10 m/25 m2. (c) The determination of the minimum sharpness of the ‘cut-off’ has been carried out at 10 m/25 m2. 9.8. The adjustment of the ‘cut-off’ has been determined at 10 m/25 m2. The determination of the minimum sharpness of the ‘cut-off’ has been carried out at 10 m/25 m2. 16. The list of documents deposited with the Type Approval Authority, which has granted approval is annexed to this communication and may be obtained on request. Note: Indications according to subparagraphs 17.3(a) through 17.3(c) above are needed additionally for each further mode. Note: Indications according to subparagraphs 18.3(a) and 18.3(b) above are needed additionally for each further mode. (3) Indicate the appropriate marking as foreseen according to this Regulation for each installation unit or assembly of installation units. (4) Mark with an X where applicable. (5) To be extended if more modes are provided. (6) To be continued if more units are provided. The installation unit of a system, bearing one of the above approval marks has been approved in the Netherlands (E 4) pursuant to this Regulation under approval number 19243, meeting the requirements of this Regulation in its original form (00). The passing-beam is designed for right-hand traffic only. The letters ‘CT’ (Figure 1) indicate that it concerns a passing-beam with bending mode and the letters ‘CWR’ (Figure 2) indicate that it concerns a Class C passing-beam and a Class W passing-beam and a driving-beam. Number 30 indicates that the maximum luminous intensity of the driving-beam is between 123 625 and 145 125 candelas. 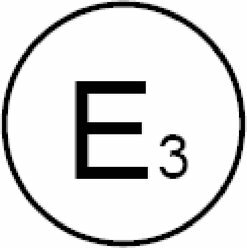 Note: The approval number and additional symbols shall be placed close to the circle surrounding the letter ‘E’ and either above or below that letter ‘E’, or to the right or left of that letter. The digits of the approval number shall be on the same side of that letter ‘E’ and face in the same direction. The use of Roman numerals as approval numbers should be avoided so as to prevent any confusion with other symbols. Figure 3: Class C passing-beam with Class E passing-beam for left-hand traffic only. Figures 4a and 4b: Class C passing-beam with Class V passing-beam for both traffic systems by means of an appropriate adjustment of the setting of the optical element or the light source on the vehicle, and a driving-beam. Class C passing-beam, Class V passing-beam and driving-beam comply to bending lighting provisions, as indicated by the letter ‘T’. The score above the letter ‘R’ indicates that the driving-beam function is provided by more than one installation unit on that side of the system. Figure 5: Class C passing-beam and Class W passing-beam for both traffic systems. Figure 6: Class C passing-beam with bending mode for right-hand traffic only. Figure 7: The installation unit, bearing this approval mark is meeting the requirements of this Regulation in respect of the Class C passing-beam with Class V passing-beam and designed for left-hand traffic only. Figure 8: The installation unit, bearing this approval mark is a (separate) installation unit of a system, meeting the requirements of this Regulation in respect of the driving-beam only. Identification of an installation unit incorporating a lens of plastic material meeting the requirements of this Regulation. Figure 9: In respect to the Class C passing-beam, the Class W passing-beam both with bending modes and a driving-beam, and designed for right-hand traffic only. The passing-beam and its modes shall not be operated simultaneously with the driving-beam in and/or another reciprocally incorporated headlamp. Figure 10: In respect to the Class E passing-beam, the Class W passing-beam, designed for right-hand traffic only and a driving-beam. 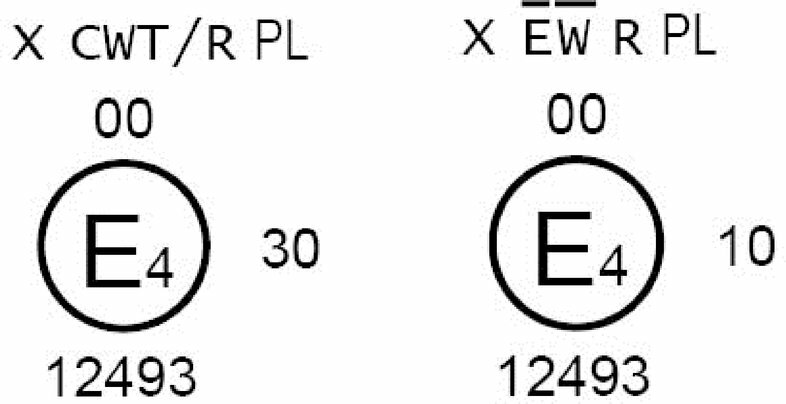 The score above the letters ‘E’ and ‘W’ indicates that these passing-beam classes are provided on that side of the system by more than this installation unit. A front direction indicator lamp of category 1a approved in accordance with the 01 series of amendments to Regulation No 6. A front fog lamp approved in accordance with the 02 series of amendments to Regulation No 19, or a Class C passing-beam with bending mode, designed for right- and left-hand traffic, provided to work with one or more other installation unit(s) on that side of the system, as indicated by the score above the letter ‘C’. These two examples correspond to an adaptive front-lighting system composed of two installation units (providing the same functions) per side of the system (units 1 and 3 for the left side, and units 2 and 4 for the right side). The installation unit 1 (or 2) of the system bearing the above approval marks meeting the requirements of this Regulation (00 series of amendments) in respect of both a Class C passing-beam for left-hand traffic and a driving-beam with a maximum luminous intensity comprised between 123 625 and 145 125 candelas (indicated by the number 30), grouped with a front direction indicator lamp of category 1a, approved in accordance with the 01 series of amendments of Regulation No 6. In example 7a: the installation unit 1 (or 2) of the system comprises a Class C passing-beam with bending mode, a Class W passing-beam, a Class V passing-beam and a Class E passing-beam. The score above the letter ‘C’ indicates that the Class C passing-beam is provided by two installation units on that side of the system. The installation unit 3 (or 4) is designed to provide a second part of the Class C passing-beam on that side of the system as indicated by the score above ‘C’. In example 7b: the installation unit 1 (or 2) of the system is designed to provide a Class C passing-beam, a Class W passing-beam and a Class E passing-beam. The score above the letter ‘W’ indicates that the Class W passing-beam is provided by two installation units on that side of the system. The letter ‘T’ to the right, following the listed symbols (and left of the approval number) indicates that each, the Class C passing-beam, the Class W passing-beam, the Class E passing-beam, and the driving-beam are providing a bending mode. The installation unit 3 (or 4) of the system is designed to provide the second part of the Class W passing-beam on that side of the system (as indicated by the score above the letter ‘W’), and the Class V passing-beam. This example corresponds to an adaptive front-lighting system composed of two installation units for the left side of the vehicle and one installation unit for the right side. The system bearing the above approval marks meets the requirements of this Regulation (original version of the Regulation) in respect of both a passing-beam for left-hand traffic and a driving-beam with a maximum intensity comprised between 86 250 and 101 250 candelas (as indicated by the number 30) grouped with a front direction indicator lamp of category 1a, approved in accordance with the 01 series of amendments of Regulation No 6 and a front position lamp approved in accordance with the 02 series of amendments of Regulation No 7. The installation unit 1 of the system (left side) is designed to contribute to the Class C passing-beam and the Class E passing-beam. The score above the letter ‘C’ indicates that on that side more than one installation unit contributes to the Class C passing-beam. The letter ‘T’ to the right following the listed symbols indicates that each, the Class C passing-beam and the Class E passing-beam are providing a bending mode. The installation unit 3 of the system (left side) is designed to provide the second part of the Class C passing-beam of that side (as indicated by the score above the letter ‘C’) and a Class W passing-beam. The installation unit 2 of the system (right side) is designed to contribute to the Class C passing-beam, a Class E passing-beam, both with bending mode and a Class W passing-beam. Note: In the above examples Nos 6 and 7, the different installation units of the system shall bear the same approval number. The LED module bearing the light source module identification code shown above has been approved together with an AFS initially approved in Italy (E 3) under approval number 17325. ‘below it’ means vertically below, only. Angular positions are expressed in deg up (U) or down (D) from H-H respectively right (R) or left (L) from V-V. The maximum luminous intensity in ‘Segment Imax’ as indicated in this table shall be within the limits as prescribed in Table 1, Line No 18. Definition and requirements for segments E, F1, F2, and F3 (not shown in Fig. 1 above). Not more than 175 cd is allowed: (a) on a segment E extending at U 10 deg from L 20 to R 20 deg and (b) on three vertical segments F1, F2 and F3 at horizontal positions L10 degrees, V and R 10 degrees, each extending from U 10 to U 60 degrees. Table 1 Part A or B applies, however with the max requirements in lines No 16, 17 and 18 being replaced by those indicated hereunder. If, according to the applicants specification according to paragraph 2.2.2(e) of this Regulation a Class W passing-beam is designed to produce on segment 20 and below it not more than 8 800 cd and on segment 10 and below it not more than 3 550 cd, the design value for Imax of that beam shall not exceed 88 100 cd. Table 1 Part A or B and Table 2 above apply, however with the lines No 1 and 18 of Table 1 and item 2.2 of Table 2 being replaced as indicated hereunder. (*1) Note: Measurement procedure prescribed in Annex 9 to this Regulation. (1) Max 15 900 cd, if the system is designed to provide also a Class W passing-beam. (4) The contribution of each side of the system (for segment BLL and BRR: of at least one point), when measured according to the provisions of Annex 9 to this Regulation shall not be less than 50 cd. (5) Position requirements according to the provisions of Table 5 below. (6) One pair of position lamps, being incorporated with the system or being intended to be installed together with the system may be activated according to the indications of the applicant. (7) Requirements according to the provisions indicated in Table 6 below apply in addition. (8) The max. value may be multiplied by 1,4, if it is guaranteed according to the manufacturer's description that this value will not be exceeded in use, either by means of the system or, if the system's use is confined to vehicles, providing a corresponding stabilization/limitation of the system's supply, as indicated in the communication form. (9) Requirements according to the provisions indicated in Table 6 below apply in addition. (*2) Angular positions are indicated for right-hand traffic. (*3) The photometric requirements for each single measuring point (angular position) of this lighting function apply to half of the sum of the respective measured values from all lighting units of the system applied for this function. Each of the lines defined in part A of Table 7, in conjunction with the test points as prescribed in part B of Table 7 shall be measured individually corresponding to the signal provided by the signal generator. In the case where the passing-beam, which meets the requirements of paragraph 6.2 of this Regulation, is continuously operated in conjunction with the adaptation of the driving-beam, the photometric requirements in Part B of the Table 7 shall not be applied. Once the photometric values have been measured according to the prescriptions of this Regulation, in the point of Imax for driving beam and in points 25L, 50V and B50L (or R), whichever applies for passing beam, a complete system sample shall be tested for stability of photometric performance in operation. The expression ‘light source’ shall be understood to comprise also any single filament of a filament lamp, LED modules or light emitting parts of a LED module. In the case of a system providing an adaptation of the driving-beam, the driving-beam shall be in the maximum condition if activated. The measuring equipment shall be equivalent to that used during type approval tests of the test samples of the system. The system or part(s) thereof shall, prior to the subsequent tests, be set to the neutral state. The test sample shall be operated on passing-beam without being dismounted from or readjusted in relation to its test fixture. The light source used shall be a light source of the category specified for that headlamp. Each test sample shall be operated for 12 hours as described in paragraph 1.1.1 and checked as prescribed in paragraph 1.1.2 below. In the case where a test sample provides more than one function or class of passing-beam according to this Regulation: if the applicant declares that each specified function or class of passing-beam of the test sample has its own light source(s), being exclusively lit (2) at a time, the test shall be carried out in accordance with this condition, activating (1) the most power consuming mode of each specified function or class of passing-beam successively for the same (equally divided) part of the time specified in paragraph 1.1 above. In the case of a test sample designed to provide a passing-beam bending mode or a mode or function which is activated for a short time with an additional light source being energized, said light source shall simultaneously be switched on for 1 minute, and switched off for 9 minutes during the activation of the passing-beam only, specified in (a) or (b) above. In case of replaceable filament light source(s) operated directly under vehicle voltage system conditions: the test shall be performed at 6,3 V, 13,2 V or 28,0 V as applicable, except if the applicant specifies that the test sample may be used at a different voltage. In this case, the test shall be carried out with the filament light source operated at the highest voltage that can be used. In case of replaceable gas discharge light source(s): The test voltage for the electronic light source control-gear is 13,2 + 0,1 volts for 12 V vehicle voltage system, or otherwise specified in the application for approval. In the case of non-replaceable light source operated directly under vehicle voltage system conditions: All measurements on lighting units equipped with non-replaceable light sources (filament light sources and/or others) shall be made at 6,3 V, 13,2 V or 28,0 V or at other voltages according to the vehicle voltage system as specified by the applicant respectively. In the case of light sources, replaceable or non-replaceable, being operated independently from vehicle supply voltage and fully controlled by the system, or, in the case of light sources supplied by a supply and operating device, the test voltages as specified above shall be applied to the input terminals of that device. The test laboratory may require from the manufacturer the supply and operating device or a special power supply needed to supply the light source(s). LED module(s) shall be measured at 6,3 V, 13,2 V or 28 V respectively, if not otherwise specified within this Regulation. LED module(s) operated by an electronic light source control gear, shall be measured as specified by the applicant. Where signalling lamps are grouped, combined or reciprocally incorporated into the test sample and operating at voltages other than the nominal rated voltages of 6 V, 12 V or 24 V respectively, the voltage shall be adjusted as declared by the manufacturer for the correct photometric functioning of that lamp. Once the test sample has been stabilized to the ambient temperature, the test sample lens and the external lens, if any, shall be cleaned with a clean, damp cotton cloth. It shall then be inspected visually; no distortion, deformation, cracking or change in colour of either the test sample lens or the external lens, if any, shall be noticeable. Class C passing-beam, and each specified other passing-beam class: 50V, B50L, and 25RR, if applicable. Driving-beam, under neutral state conditions: point of Imax. Another aiming may be carried out to allow for any deformation of the test sample base due to heat (the change of the position of the cut-off line is covered in paragraph 2 of this annex). Except for points B50L, a 10 per cent discrepancy between the photometric characteristics and the values measured prior to the test is permissible including the tolerances of the photometric procedure. The value measured at point B50L shall not exceed the photometric value measured prior to the test by more than 170 cd. After being tested as specified in paragraph 1.1 above, the test sample shall be operated for one hour as described in paragraph 1.1.1 for each function or class of passing-beam (4), after being prepared as prescribed in paragraph 1.2.1, and checked as prescribed in paragraph 1.1.2; after each test a sufficient cooling down period must be assured. an appropriate quantity of distilled water with a conductivity of less than 1 μS/m. 2 ± 1 drops of surfactant (6). 1.2.1.3. The mixture must not be more than 14 days old. 50V for a class C passing beam, and each specified passing beam mode. This test consists of verifying that the vertical drift of the cut-off line under the influence of heat does not exceed a specified value for a system or part(s) of emitting a Class C (basic) passing-beam, or each specified passing-beam mode. If the test sample consists of more than one lighting unit or more than one assembly of lighting units which provide a cut-off, each of these is understood to be a test sample for the purpose of this test and must be tested separately. The test sample tested in accordance with paragraph 1 above shall be subjected to the test described in paragraph 2.1 below, without being removed from or readjusted in relation to its test fixture. If the test sample has a moving optical part, only the position closest to the average vertical angular stroke and/or the initial position according to the neutral state is chosen for this test. The test is confined to signal input conditions corresponding to a straight road, only. For the purpose of this test, the voltage shall be adjusted as specified in paragraph 1.1.1.2 above. The test sample shall be operated and tested on Class C passing-beam, Class V passing-beam, Class E passing-beam and Class W passing-beam, whatever applies. The position of the cut-off line in its horizontal part between VV and the vertical line passing through point B50L (or R) shall be verified 3 minutes (r3) and 60 minutes (r60) respectively after operation. The measurement of the variation in the cut-off line position as described above shall be carried out by any method giving acceptable accuracy and reproducible results. 2.2.1. The result expressed in milliradians (mrad) shall be considered as acceptable for a passing beam headlamp when the absolute value Δ r1 = | r3 – r60 | recorded on the headlamp is not more than 1,0 mrad (Δ r1 ≤ 1,0 mrad) upward and not more than 2,0 mrad (Δ r1 ≤ 2,0 mrad) downwards. One hour period with the lamp switched off. After these three cycles, the headlamp type shall be considered as acceptable if the absolute values Δr measured according to paragraph 2.1 above on this further sample meet the requirements in paragraph 2.2.1 above. (1) When the ‘test sample’ is grouped and/or reciprocally incorporated with signalling lamps, the latter shall be lit for the duration of the test, except for a daytime running lamp. In the case of a direction indicator lamp, it shall be lit in flashing operation mode with an on/off time ratio of approximately one to one. (2) Should additional light sources be simultaneously lit when headlamp flashing is used, this shall not be considered as being normal use of the light sources simultaneously. (3) All light sources of lighting functions even if no approval is sought according to this Regulation must be taken into account, except those covered by footnote 2. (4) The Class W passing-beam, if any, is disregarded for lighting units providing or contributing to any other passing-beam class or lighting function. (5) NaCMC represents the sodium salt of carboxymethylcellulose, customarily referred to as CMC. The NaCMC used in the dirt mixture shall have a degree of substitution (DS) of 0,6-0,7 and a viscosity of 200-300 cP for a 2 per cent solution at 20 °C. 1.1. The conformity requirements shall be considered satisfied from a mechanical and a geometrical standpoint, if the differences do not exceed inevitable manufacturing deviations within the requirements of this Regulation. This condition also applies to colour. Minimum values at BR, P, at the groups S 50+ S 50LL+ S 50RR, S 100+ S 100LL+ S 100RR, and those required by footnote 4 of Table 1 in Annex 3 of this Regulation (B50L, BR, BRR, BLL): half of the required value equivalent 20 per cent and three quarter of the required value equivalent 30 per cent. For the driving-beam, HV being situated within the isolux 0,75 Imax, a tolerance of +20 per cent for maximum values and -20 per cent for minimum values is observed for the photometric values at any measuring point specified in paragraph 6.3.2 of this Regulation. If the results of the test described above do not meet the requirements, the alignment of the system may be changed, provided that the axis of the beam is not displaced laterally by more than 0,5 degree to the right or left and not by more than 0,2 degree up and down, each independently and with respect to the first aiming. These provisions do not apply to lighting units as indicated under paragraph 6.3.1.1 of this Regulation. If the results of the tests described above do not meet the requirements, tests shall be repeated using another standard (étalon) light source and/or another supply and operating device. One of the sampled systems shall be tested according to the procedure described in paragraph 2.1 of Annex 4 after being subjected three consecutive times to the cycle described in paragraph 2.2.2 of Annex 4. The system shall be considered as acceptable if Δr does not exceed 1,5 mrad. If this value exceeds 1,5 mrad but is not more than 2,0 mrad, a second sample shall be subjected to the test after which the mean of the absolute values recorded on both samples shall not exceed 1,5 mrad. 1.4. The chromaticity coordinates shall be conformed to. For each type of system the holder of the approval mark shall carry out at least the following tests, at appropriate intervals. The tests shall be carried out in accordance with the provision of this Regulation. Tests of conformity in this Regulation shall cover the photometric characteristics and the verification of the change in vertical position of the cut-off line for passing-beam under the influence of heat. 2.2.2. In any test of conformity carried out by the manufacturer, equivalent methods may be used with the consent of the competent authority responsible for approval tests. The manufacturer is responsible for proving that the applied methods are equivalent to those laid down in this Regulation. 2.2.3. The application of paragraphs 2.2.1 and 2.2.2 above requires regular calibration of test apparatus and its correlation with measurement made by a competent authority. 2.2.4. In all cases the reference methods shall be those of this Regulation, particular for the purpose of administrative verification and sampling. Samples of systems shall be selected at random from the production of a uniform batch. A uniform batch means a set of systems of the same type, defined according to the production methods of the manufacturer. The assessment shall, in general, cover series production from individual factories. However, a manufacturer may group together records concerning the same type from several factories provided these operate under the same quality system and quality management. To points B50L, 50L, 50V, 75R if applicable, and 25LL in the case of the passing beam(s) (see Figure 1 in Annex 3). The manufacturer is responsible for carrying out a statistical study of the test results and for defining, in agreement with the Type Approval Authority, criteria governing acceptability of his products in order to meet the specification laid down for verification of conformity of products in paragraph 9.1 of this Regulation. The criteria governing acceptability shall be such that, with a confidence level of 95 per cent, the minimum probability of passing a spot check in accordance with Annex 7 (first sampling) would be 0,95. (1) When the driving beam is reciprocally incorporated with the passing beam, HV in the case of the driving beam shall be the same measuring point as in the case of the passing beam. (2) ‘HL’ and ‘HR’: points on ‘H-H’ located at 2,6 degrees to the left and to the right of point HV respectively. 1.1. The samples supplied pursuant to paragraph 2.2.4 of this Regulation shall satisfy the specifications indicated in paragraphs 2.1 to 2.5 below. 1.2. The set of samples of complete systems or part thereof supplied pursuant to paragraph 2.2.3 of this Regulation and incorporating lenses of plastic material shall, with regard to the lens material, satisfy the specifications indicated in paragraph 2.6 below. 1.3. The samples of lenses of plastic material or samples of material shall be subjected, with the reflector to which they are intended to be fitted (where applicable), to approval tests in the chronological order indicated in Table A reproduced in Appendix 1 to this annex. 1.4. However, if the system manufacturer can prove that the product has already passed the tests prescribed in paragraphs 2.1 to 2.5 below, or the equivalent tests pursuant to another Regulation, those tests do not need to be repeated; only the tests prescribed in Appendix 1, Table B, shall be mandatory. 1.5. If the system or part thereof is designed for right-hand installation only, or for left-hand installation only, tests pursuant to this annex may be done on one sample only, at the choice of the applicant. Before this test, the samples shall be kept at 23 °C ± 5 °C and 60-75 per cent RH for at least four hours. Note: The periods of one hour at 23 °C ± 5 °C shall include the periods of transition from one temperature to another which are needed in order to avoid thermal shock effects. Photometric measurements shall be carried out on the samples before and after the test. Imax for the driving beam of a system. The variation between the photometric values measured on each sample before and after the test shall not exceed 10 per cent including the tolerances of the photometric procedure. Three new samples (lenses or samples of material) shall be exposed to radiation from a source having a spectral energy distribution similar to that of a black body at a temperature between 5 500 K and 6 000 K. Appropriate filters shall be placed between the source and the samples so as to reduce as far as possible radiation with wave lengths smaller than 295 nm and greater than 2 500 nm. The samples shall be exposed to an energetic illumination of 1 200 W/m2 ± 200 W/m2 for a period such that the luminous energy that they receive is equal to 4 500 MJ/m2 ± 200 MJ/m2. Within the enclosure, the temperature measured on the black panel placed on a level with the samples shall be 50 °C ± 5 °C. In order to ensure a regular exposure, the samples shall revolve around the source of radiation at a speed between 1 and 5 min– 1. Spraying: 5 minutes; drying: 25 minutes. After the test described in paragraph 2.2.1 above and the measurement described in paragraph 2.2.3.1 below have been carried out, the outer face of the said three samples shall be treated as described in paragraph 2.2.2.2 with the mixture defined in paragraph 2.2.2.1 below. The test mixture shall be composed of 61,5 per cent n-heptane, 12,5 per cent toluene, 7,5 per cent ethyl tetrachloride, 12,5 per cent trichloroethylene and 6 per cent xylene (volume per cent). Soak a piece of cotton cloth (as per ISO 105) until saturation with the mixture defined in paragraph 2.2.2.1 above and, within 10 seconds, apply it for 10 minutes to the outer face of the sample at a pressure of 50 N/cm2, corresponding to an effort of 100 N applied on a test surface of 14 × 14 mm. During this 10-minute period, the cloth pad shall be soaked again with the mixture so that the composition of the liquid applied is continuously identical with that of the test mixture prescribed. During the period of application, it is permissible to compensate the pressure applied to the sample in order to prevent it from causing cracks. At the end of the application of the test mixture, the samples shall be dried in the open air and then washed with the solution described in paragraph 2.3 (Resistance to detergents and hydrocarbons) at 23 °C ± 5 °C. Afterwards the samples shall be carefully rinsed with distilled water containing not more than 0,2 per cent impurities at 23 °C ± 5 °C and then wiped off with a soft cloth. 2.2.3.1. After the test of resistance to atmospheric agents, the outer face of the samples shall be free from cracks, scratches, chipping and deformation, and the mean variation in transmission Δt = (T2 – T3)/T2 measured on the three samples according to the procedure described in Appendix 2 to this annex shall not exceed 0,020 (Δtm < 0,020). 2.2.3.2. After the test of resistance to chemical agents, the samples shall not bear any traces of chemical staining likely to cause a variation of flux diffusion, whose mean variation Δd = (T5 – T4)/T2 measured on the three samples according to the procedure described in Appendix 2 to this annex shall not exceed 0,020 (Δdm < 0,020). Flat samples of each light transmitting plastic component of the system are exposed to the light of the light source. The parameters such as angles and distances of those samples shall be the same as in the system. These samples shall have the same colour and surface treatment, if any, as the parts of the system. After 1 500 hours of continuous exposure, the colorimetric specification of the transmitted light must be met with a new light source, and the surface of the samples shall be free of cracks, scratches, scaling or deformation. The UV-resistance testing of internal materials to light source radiation is not necessary if light sources according to Regulation No 37 and/or low-UV-type gas discharge light sources and/or low-UV-type LED modules are being applied or if provisions are taken, to shield the relevant system components from UV radiation, e.g. by glass filters. The outer face of three samples (lenses or samples of material) shall be heated to 50 °C ± 5 °C and then immersed for five minutes in a mixture maintained at 23 °C ± 5 °C and composed of 99 parts distilled water containing not more than 0,02 per cent impurities and one part alkylaryl sulphonate. At the end of the test, the samples shall be dried at 50 °C ± 5 °C. The surface of the samples shall be cleaned with a moist cloth. The outer face of these three samples shall then be lightly rubbed for one minute with a cotton cloth soaked in a mixture composed of 70 per cent n-heptane and 30 per cent toluene (volume per cent), and shall then be dried in the open air. After the above two tests have been performed successively, the mean value of the variation in transmission Δt = T2 – T3)/T2 measured on the three samples according to the procedure described in Appendix 2 to this annex shall not exceed 0,010 (Δtm ≤ 0,010). The outer face of the three new samples (lenses) shall be subjected to the uniform mechanical deterioration test by the method described in Appendix 3 to this annex. Δtm ≤ 0,100; Δdm ≤ 0,050. A surface of 20 mm × 20 mm in area of the coating of a lens shall be cut with a razor blade or a needle into a grid of squares approximately 2 mm × 2 mm. The pressure on the blade or needle shall be sufficient to cut at least the coating. Use an adhesive tape with a force adhesion of 2 N/(cm of width) ± 20 per cent measured under the standardized conditions specified in Appendix 4 to this annex. This adhesive tape, which shall be at least 25 mm wide, shall be pressed for at least five minutes to the surface prepared as prescribed in paragraph 2.5.1 above. Then the end of the adhesive tape shall be loaded in such a way that the force of adhesion to the surface considered is balanced by a force perpendicular to that surface. At this stage, the tape shall be torn off at a constant speed of 1,5 m/s ± 0,2 m/s. There shall be no appreciable impairment of the gridded area. Impairments at the intersections between squares or at the edges of the cuts shall be permitted, provided that the impaired area does not exceed 15 per cent of the gridded surface. The lens of system sample No 1 shall be subjected to the test described in paragraph 2.4.1 above. After the test, the results of photometric measurements carried out on the system or part thereof in accordance with this Regulation shall not exceed by more than 30 per cent the maximum values prescribed at point B50L and not be more than 10 per cent below the minimum values prescribed at point 75R, if applicable. The lens of installation unit sample No 2 shall be subjected to the test described in paragraph 2.5 above. After the test described in paragraph 2.6.1.1 above, the photometric values at the points of measurement considered in paragraph 2.6.1.2 are within the limits prescribed for conformity of production by this Regulation. 3.2. If the test results fail to satisfy the requirements, the tests shall be repeated on another sample of systems selected at random. B. TESTS ON COMPLETE SYSTEMS OR PART(S) THEREOF (SUPPLIED PURSUANT TO PARAGRAPH 2.2.3 OF THIS REGULATION). The beam of a collimator K with a half divergence β/2 = 17,4 × 10 – 4 rad is limited by a diaphragm Dτ with an opening of 6 mm against which the sample stand is placed. A convergent achromatic lens L2, corrected for spherical aberrations links the diaphragm Dτ with the receiver R; the diameter of the lens L2 shall be such that it does not diaphragm the light diffused by the sample in a cone with a half top angle of β/2 = 14 degrees. An annular diaphragm DD, with angles αo/2 = 1 deg and αmax/2 = 12 degrees is placed in an image focal plane of the lens L2. The non-transparent central part of the diaphragm is necessary in order to eliminate the light arriving directly from the light source. It shall be possible to remove the central part of the diaphragm from the light beam in such a manner that it returns exactly to its original position. The distance L2 Dτ and the focal length F2 of the lens L2 shall be so chosen that the image of Dτ completely covers the receiver R.
For L2 it is recommended to use a focal distance of about 80 mm. When the initial incident flux is referred to 1 the absolute precision of each reading shall be better than 0,001. The spray gun used shall be equipped with a nozzle 1,3 mm in diameter allowing a liquid flow rate of 0,24 ± 0,02 l/minute at an operating pressure of 6,0 bars – 0/+ 0,5 bar. Under these operation conditions the fan pattern obtained shall be 170 mm ± 50 mm in diameter on the surface exposed to deterioration, at a distance of 380 mm ± 10 mm from the nozzle. Water of hardness not exceeding 205 g/m3 for a mixture comprising 25 g of sand per litre of water. The outer surface of the lamp lenses shall be subjected once or more than once to the action of the sand jet produced as described above. The jet shall be sprayed almost perpendicular to the surface to be tested. The deterioration shall be checked by means of one or more samples of glass placed as a reference near the lenses to be tested. The mixture shall be sprayed until the variation in the diffusion of light on the sample or samples measured by the method described in Appendix 2, is such that: Δd = (T5 – T4)/T2 = 0,0250 ± 0,0025. Several reference samples may be used to check that the whole surface to be tested has deteriorated homogeneously. This method allows to determine under standard conditions the linear force of adhesion of an adhesive tape to a glass plate. Measurement of the force necessary to unstick an adhesive tape from a glass plate at an angle of 90 degrees. The ambient conditions shall be at 23 °C ± 5 °C and 65 ± 15 per cent relative humidity. Before the test, the sample roll of adhesive tape shall be conditioned for 24 hours in the specified atmosphere (see paragraph 3 above). Five test pieces each 400 mm long shall be tested from each roll. These test pieces shall be taken from the roll after the first three turns were discarded. The test shall be performed under the ambient conditions specified in paragraph 3 above. Apply the tape to the glass plate progressively with a slight length- wise rubbing movement of the finger, without excessive pressure, in such a manner as to leave no air bubble between the tape and the glass plate. Leave the assembly in the specified atmospheric conditions for 10 minutes. Unstick about 25 mm of the test piece from the plate in a plane perpendicular to the axis of the test piece. Fix the plate and fold back the free end of the tape at 90 degrees. Apply force in such a manner that the separation line between the tape and the plate is perpendicular to this force and perpendicular to the plate. Pull to unstick at a speed of 300 mm/s ± 30 mm/s and record the force required. The five values obtained shall be arranged in order and the median value taken as a result of the measurement. This value shall be expressed in Newton per centimetre of width of the tape. Minimum values at BR, P, at the groups S50 + S50LL + S50RR, S100 + S100LL + S100RR, and those required by footnote 4 of Table 1 in Annex 3 of this Regulation (B50L, BR, BRR, BLL): half of the required value is equivalent to 20 per cent and three quarters of the required value equivalent to 30 per cent. 1.2.1.2. For the driving-beam, HV being situated within the isolux 0,75 Imax, a tolerance of + 20 per cent for maximum values and -20 per cent for minimum values is observed for the photometric values at any measuring point specified in paragraph 6.3.2 of this Regulation. If the results of the test described above do not meet the requirements, the alignment of the system may be changed, provided that the axis of the beam is not displaced laterally by more than 0,5 degree to the right or left and not by more than 0,2 degree up and down. These provisions do not apply to lighting units as indicated under paragraph 6.3.1.1 of this Regulation. Systems with apparent defects are disregarded. The reference mark is disregarded. In the first sampling four systems are selected at random. The first sample of two is marked A, the second sample of two is marked B. 2.1.2. Or if the conditions of paragraph 1.2.2 above for sample A are fulfilled. 2.2.2. Or if the conditions of paragraph 1.2.2 above for sample A are not fulfilled. Or if the conditions of paragraph 1.2.2 above for samples A and B are not fulfilled. 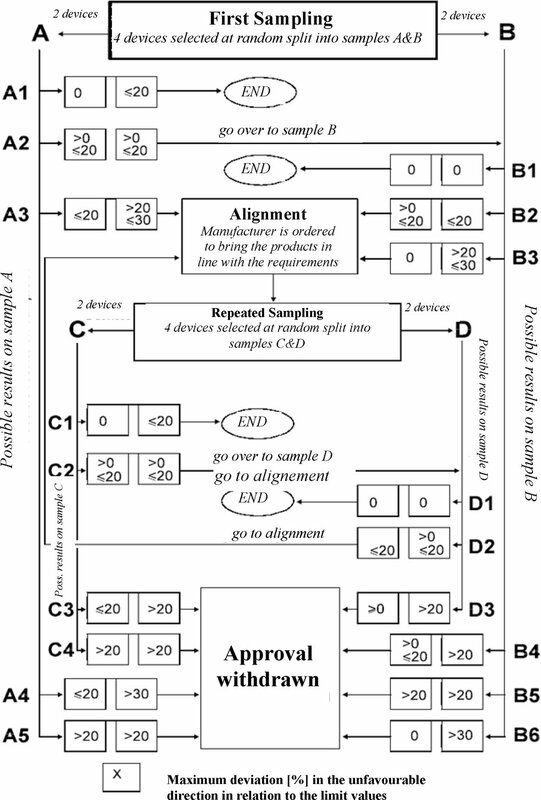 In the case of A3, B2, B3 a repeated sampling, third sample C of two systems and fourth sample D of two systems, selected from stock manufactured after alignment, is necessary within two months' time after the notification. 3.1.2. Or if the conditions of paragraph 1.2.2 above for sample C are fulfilled. Or if the conditions of paragraph 1.2.2 for sample C are not fulfilled. Or if the conditions of paragraph 1.2.2 above for samples C and D are not fulfilled. One of the systems of sample A after sampling procedure in Figure 1 of this annex shall be tested according to the procedure described in paragraph 2.1 of Annex 4 after being subjected three consecutive times to the cycle described in paragraph 2.2.2 of Annex 4. The system shall be considered as acceptable if Δr does not exceed 1,5 m rad upwards and does not exceed 2,5 mrad downwards. If this value exceeds 1,5 mrad but is not more than 2,0 mrad upwards or exceeds 2,5 mrad but is not more than 3,0 mrad downwards, the second system of sample A shall be subjected to the test after which the mean of the absolute values recorded on both samples shall not exceed 1,5 m rad upwards and shall not exceed 2,5 mrad downwards. However, if this value of 1,5 mrad upwards and 2,5 mrad downwards on sample A is not complied with, the two systems of sample B shall be subjected to the same procedure and the value of Δr for each of them shall not exceed 1,5 mrad upwards and shall not exceed 2,5 mrad downwards. Note: ‘device’ in this figure means ‘system’. The ‘cut-off’, when projected on the aiming screen shall be sufficiently sharp to permit aiming; it shall comply with the following requirements. A raised ‘elbow – shoulder’ part towards the right. In each case the ‘elbow – shoulder’ part shall have a sharp edge. 2.1. The system shall, prior to the subsequent test procedures, be set to the neutral state. The instructions below apply to the beams of those lighting units, which are specified by the applicant to be aimed. 2.2. The beam shall be visually aimed by means of the ‘cut-off’ (see Figure 1 below). The aiming shall be carried out using a flat vertical screen set up at a distance of 10 m or 25 m (as indicated in section 9 of Annex 1) forward of the headlamp and at right angles to the H-V axis. The screen shall be sufficiently wide to allow examination and adjustment of the ‘cut-off’ of the passing-beam over at least 5° on either side of the V-V line. 2.3. 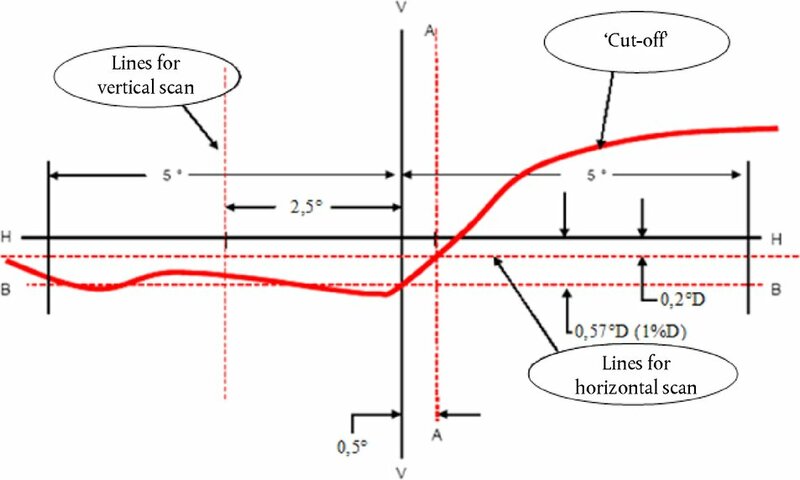 For vertical adjustment: the horizontal part of the ‘cut-off’ is moved upward from below line B and adjusted to its nominal position one per cent (25 cm) below the H-H line. Note: The scales are different for vertical and horizontal lines. 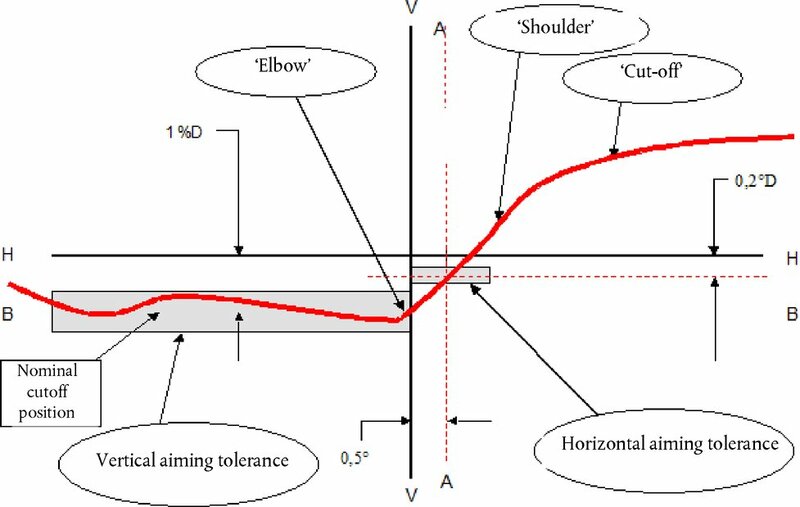 The kink of the ‘elbow’ is basically located within +/- 0,5 degree to the left or right of the V-V line. Vertically not more than 0,25° up or down from line B. 2.6. If, however, vertical adjustment cannot be performed repeatedly to the required position within the tolerances described in paragraph 2.5 above, the instrumental method described in paragraph 3 below shall be applied to test compliance with the required minimum quality of the ‘cut-off’ (as defined in paragraph 2.7 below) and to perform the vertical and horizontal adjustment of the beam. 25 m with a detector having a diameter of approximately 30 mm. The measuring distance at which the test was carried out shall be recorded in item 9.8 of the communication form (see Annex 1 to this Regulation). 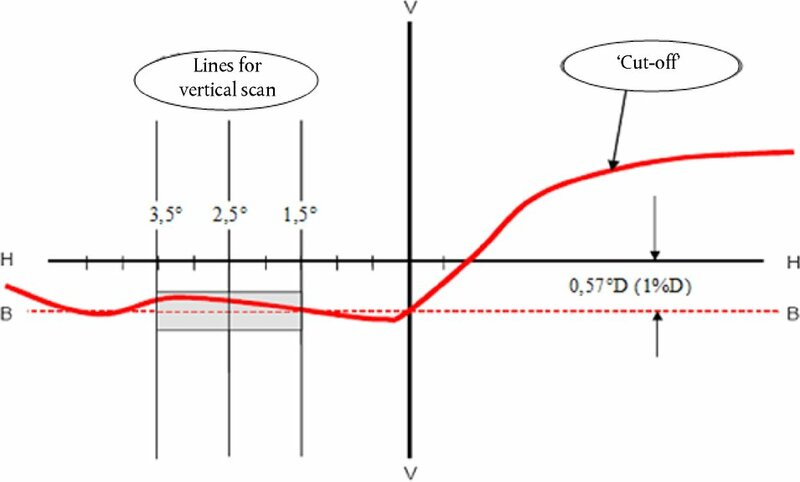 To determine the maximum sharpness, measurements shall be performed by vertically scanning through the horizontal part of the ‘cut-off’ in angular steps of 0,05° exclusively at a measurement distance of 25 m and with a detector having a diameter of approximately 30 mm. The ‘cut-off’ quality shall be considered acceptable if the requirements of paragraph 2.1 to 2.3 above comply with at least one set of measurements. 2.7.1. Not more than one ‘cut-off’ shall be visible (1). G = (log Εβ - log E(β + 0,1°)) where β = the vertical position in degrees. The value of G shall not be less than 0,13 (minimum sharpness) and not greater than 0,40 (maximum sharpness). (d2 (log E)/dβ2 = 0). The maximum vertical distance between the inflection points determined shall not exceed 0,2°. 2.8. If a partial beam provides a horizontal ‘cut-off’ only: no special requirements for horizontal adjustment apply if not specified by the applicant. 2.9. Any ‘cut-off’ of a lighting unit not designed to be separately aimed, according to the applicants specification, must comply with the relevant requirements. 2.10. Lighting units when aimed using a method specified by the applicant in accordance with the provisions of the paragraphs 5.2 and 6.2.1.1 of this Regulation: the shape and position of the ‘cut-off’, if any, shall comply with the respective requirements of Table 2 of Annex 3 to this Regulation. 2.11. For each further mode of passing-beam, the shape and position of the ‘cut-off’, if any, shall comply automatically with the respective requirements of Table 2 of Annex 3. to this Regulation. 2.12. 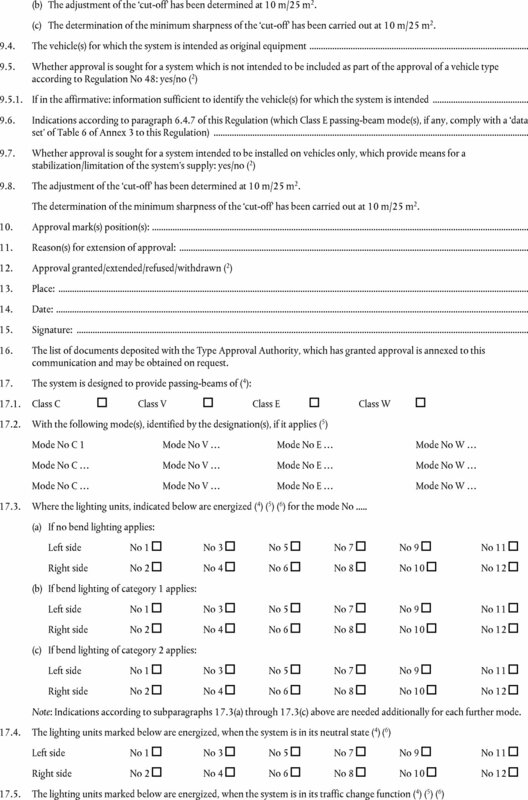 A separate initial aiming and/or adjustment process according to the applicant's specification, based on the provisions of paragraphs 2.1 through 2.6 above, may apply to lighting units intended to be installed separately. If the ‘cut-off’ complies with the quality requirements of paragraph 2 of this Annex, the beam adjustment may be performed instrumentally. Moving upward from below the line B (see Figure 2 below), a vertical scan is carried out through the horizontal part of the ‘cut-off’ at 2,5° from V-V. The inflection point (where d2 (log E)/dv2 = 0) is determined and positioned on the line B situated one per cent below H-H. The ‘0,2 D line’ method (see Figure 2 below). A single horizontal line at 0,2° D shall be scanned from 5° left to 5° right after the lamp has been aimed vertically. The maximum gradient ‘G’ determined using the formula G = (log Εβ – log E(β + 0,1°)) where β is the horizontal position in degrees, shall not be less than 0,08. The inflection point found on the 0,2 D line shall be positioned on the line A. Where β is the vertical position in degrees shall not be less than 0,08. 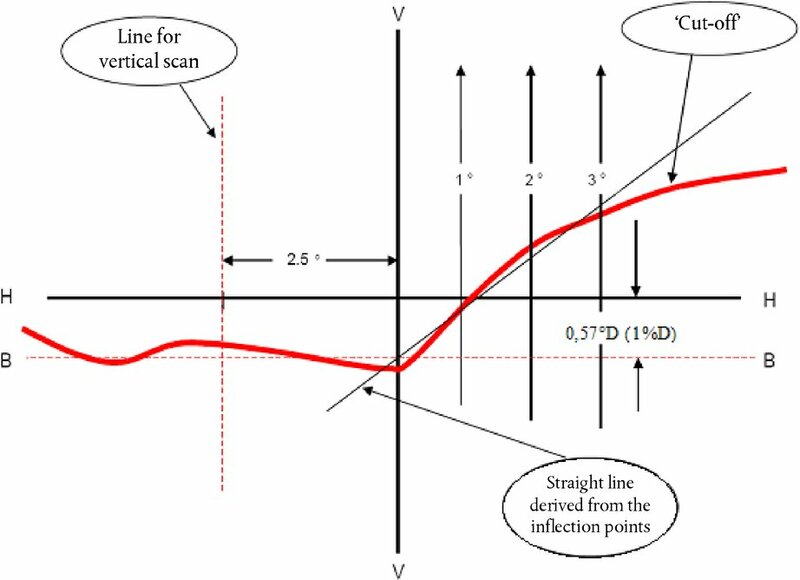 The inflection points found on the three lines shall be used to derive a straight line. The intersection of this line and the line B found while performing vertical aim shall be placed on the V line. (1) This paragraph should be amended when an objective test method is available. 1.1. The system or part(s) thereof shall be mounted on a gonio(photo)meter system. 1.2. The luminous intensity values shall be determined by means of a photoreceptor contained within a square of 65 mm side and set up to a distance of at least 25 m forward of the centre of reference of each lighting unit perpendicular to the measurement axis from the origin of the gonio(photo)meter system. 1.3. During photometric measurements, stray reflections should be avoided by appropriate masking. 1.4. The luminous intensities are measured at a nominal distance of 25 m.
1.5. The angular coordinates are specified in degrees on a sphere corresponding to a gonio(photo)meter system as defined in Regulation No 48 (see Diagram 1). 1.6. Any equivalent photometric method is acceptable, if the accordingly applicable correlation is observed. 1.7. Any offset of the centre of reference of each lighting unit, with respect to the goniometer rotation axes, should be avoided. This applies especially to the vertical direction and to lighting units producing a ‘cut-off’. An aiming screen shall be used and may be located at a shorter distance than that of the photoreceptor. 1.8.1. However in those cases where a provision is specified for one side only, the division by the factor of 2 does not apply. These cases are: paragraphs 6.2.5.2, 6.2.8.1, 6.3.2.1.1, 6.3.2.1.2, 6.3.4.1, 6.4.6 and footnote 4 of Table 1 of Annex 3. 1.9. The lighting units of the system shall be measured individually; however, simultaneous measurements may be performed on two or more lighting units of an installation unit, being equipped with the same light source types with respect to their power supply (either power controlled or not), if they are sized and situated such, that their illuminating surfaces are completely contained in a rectangle of not more than 300 mm in horizontal extend and not more than 150 mm vertical extend, and, if a common centre of reference is specified by the manufacturer. 1.10. The system shall prior to the subsequent test procedures be set to the neutral state. 1.11. The system or part(s) thereof shall be so aimed before starting the measurements that the position of the ‘cut-off’ complies with the requirements indicated in the Table 2 of Annex 3 to this Regulation. Parts of a system measured individually and having no ‘cut-off’ shall be installed on the goniometer under the conditions (mounting position) specified by the applicant. The system or parts thereof shall be checked by means of an uncoloured standard (étalon) filament lamp(s) designed for a rated voltage of 12 V. During checking of the system or part of, the voltage at the terminals of the filament lamp(s) shall be regulated so as to obtain the reference luminous flux 13,2 volts as indicated at the relevant data sheet of Regulation No 37. For the measurements, the flux of this filament lamp may differ from the reference luminous flux at 13,2 V specified in Regulation No 37. In this case, the luminous intensity shall be corrected accordingly by the individual factor of the standard (étalon) filament lamp (F = Φ obj./Φ (Voltage)). The system or parts thereof shall be considered acceptable if the requirements of paragraph 6. of this Regulation are met with at least one standard (étalon) filament lamp, which may be submitted with the system. The voltage applied at the terminals of the ballast(s) or at the terminals of the light source(s) in case the ballast is integrated with the light source, is 13,2 V +/- 0,1 for 12 V systems. The system or parts thereof using a replaceable gas-discharge light source shall comply with the photometric requirements set out in the relevant paragraphs of this Regulation with at least one standard (étalon) light source, which has been aged during at least 15 cycles, as specified in Regulation No 99. The luminous flux of this gas-discharge light source may differ from the objective luminous flux specified in Regulation No 99. In this case, the measured photometric values shall be corrected accordingly. All measurements on lamps equipped with non-replaceable light sources (filament lamps and other) shall be made at 6,3 V, 13,2 V or 28,0 V, or at a voltage as specified by the applicant with respect to any other vehicle voltage system. 2.4. In the case of a light source, replaceable or non-replaceable, which is operated independently from vehicle supply voltage and fully controlled by the system, or in the case of a light source supplied by a special power supply, the test voltage as specified in paragraph 2.3 above shall be applied to the input terminals of that system/power supply. The test laboratory may require from the manufacturer this special power supply needed to supply the light sources. 2.5. LED module(s) shall be measured at 6,3 V, 13,2 V or 28,0 V respectively, if not otherwise specified within this Regulation. LED module(s) operated by an electronic light source control gear, shall be measured as specified by the applicant. The system shall be tested in the neutral state (central/straight), and, in addition in the state(s) corresponding to the smallest turn radius of the vehicle in both directions using the signal generator, if applicable. 3.1.1.1. Compliance with the requirements of paragraphs 6.2.5.2 and 6.2.5.4.1 of this Regulation shall be checked for both Category 1 and Category 2 bending modes without additional horizontal re-aim. In case of a category 1 or a driving-beam bending mode: after having horizontally re-aimed the relevant installation unit (by means of the goniometer for example) in the corresponding opposite direction. When testing a category 1 or category 2 bending mode, for a turn radius of the vehicle other than specified in paragraph 3.1.1 above: it shall be observed whether the light distribution is substantially uniform and no undue glare occurs. If this cannot be confirmed the compliance with the requirement laid down in Table 1 of Annex 3 to this Regulation shall be checked. (1) Mark in the respective box(es) with a cross (X) the combination(s) which apply. Physical nature (electrical current/voltage, optical, mechanical, hydraulic, pneumatic, ...). Information type (continuous/analogous, binary, digitally coded, ...). Time dependent properties (time constant, resolution, ...). Signal status when the respective conditions according to paragraph 6.22.7.4 of Regulation No 48 are fulfilled. Signal status in case of failure (with reference to the system input). (3) According to the applicants description; use separate sheet, if needed. (4) Designation of each individual lighting unit of the system as indicated in Annex 1 to this Regulation and as shown in the drawing according to paragraph 2.2.1 of this Regulation; use separate sheet(s) if needed. (5) Relevant to provisions of paragraph 6.22.6.1.2 of Regulation No 48. (6) Strike out what does not apply. (7) Indicate corresponding lighting unit(s) number(s), if applicable. (8) Information such as e.g. : the order of adjustment of lighting units or assemblies of lighting units, any additional provisions for the adjustment process. (9) The adjustment of a ‘master’ lighting unit may also adjust (an) other lighting unit(s). 1.1. Each LED module sample submitted shall conform to the relevant specifications of this Regulation when tested with the supplied electronic light source control-gear(s), if any. 1.2. LED module(s) shall be so designed as to be and to remain in good working order when in normal use. They shall moreover exhibit no fault in design or manufacture. A LED module shall be considered to have failed if any one of its LEDs has failed. 1.3. LED module(s) shall be tamperproof. LED modules with different light source module identification codes within the same lamp housing, shall not be interchangeable. 2.1. The LED(s) on the LED module shall be equipped with suitable fixation elements. 2.2. The fixation elements shall be strong and firmly secured to the LED(s) and the LED module. 3.1.1. All samples shall be tested as specified in paragraph 4. below. 3.1.2. The kind of light sources on a LED MODULE shall be light-emitting diodes (LED) as defined in Regulation No 48 paragraph 2.7.1 in particular with regard to the element of visible radiation. Other kinds of light sources are not permitted. All samples shall be tested under the conditions as specified in paragraph 2.5 of Annex 9. to this Regulation. If not specified differently in this annex LED modules shall be tested inside the AFS as submitted by the manufacturer. For the measurement of electrical and photometric characteristics, the AFS shall be operated in a dry and still atmosphere at an ambient temperature of 23 °C ± 5 °C. Upon the request of the applicant the LED module shall be operated for 15 hours and cooled down to ambient temperature before starting the tests as specified in this Regulation. This value shall be calculated using intervals of one nanometre. km = 683 lm/W is the maximum value of the luminous efficacy of radiation. (For definitions of the other symbols see paragraph 4.1.1 above). Values according to ‘IRPA/INIRC Guidelines on limits of exposure to ultraviolet radiation’. Wavelengths (in nanometres) chosen are representative; other values should be interpolated. 4.3.1.2. Operation of the lighting units mentioned in paragraph 4.3.1.1 above shall then be continued until photometric stability has occurred; this condition is considered to be fulfilled if the variation of the illuminance for the test points indicated in paragraph 4.3.1.1 above is less than 3 per cent within any 15 minutes period. After photometric stability has occurred, aiming for complete photometry shall be performed and the photometric values at all required test points shall be determined. 4.3.1.3. The ratio between the photometric values measured after one minute of operation and those measured after photometric stability has occurred shall be calculated for the test points indicated in paragraph 4.3.1.1 above. This ratio shall then be applied to all other applicable test points to determine their photometric values after one minute of operation. 4.3.1.4. The illuminance values determined after one minute of operation and after occurrence of photometric stability shall comply with applicable photometric requirements. The colour of the light emitted measured after one minute and measured after photometric stability has been obtained, as described in paragraph 4.3.1.2 of this annex, shall both be within the required colour boundaries. The LED module(s) shall be in the configuration as described in the technical specification as defined in paragraph 2.2.2 of this Regulation. Optical elements (secondary optics) shall be removed by the Technical Service at the request of the applicant by the use of tools. This procedure and the conditions during the measurements as described below shall be described in the test report. One module of each type shall be submitted by the applicant with the light source control gear, if applicable, and sufficient instructions. Suitable thermal management (e.g. heat sink) may be provided, to simulate similar thermal conditions as in the corresponding headlamp application. Before the test the LED module shall be aged at least for seventy-two hours under the same conditions as in the corresponding headlamp application. In the case of use of an integrating sphere, the sphere shall have a minimum diameter of one meter, and at least ten times the maximum dimension of the LED module, whichever is the largest. The flux measurements can also be performed by integration using a goniophotometer. The prescriptions in CIE – Publication 84 – 1989, regarding the room temperature, positioning, etc., shall be taken into consideration. The LED module shall be burned in for approximately one hour in the closed sphere or goniophotometer. The flux shall be measured after stability has occurred, as explained in paragraph 4.3.1.2 of this annex.